Whether you prefer a classic glazed or frosted delight, when it comes to doughnuts, Connecticut has your taste buds covered with amazing doughnut bakeries. Stop by one of these delicious doughnut places in Connecticut and pick up a dozen on your way to work—your colleagues will certainly thank you! Just one look at the offerings available at Donut Crazy and you’ll understand why Donut Crazy truly takes the cake—and they taste just as good as they look. With numerous flavors colorfully arranged behind glass cases, you’ll certainly have a hard time choosing just one doughnut. Delicious flavor options include French toast, peanut butter cup, and apply crumby—yum! This local favorite is absolutely worth the visit, even if you need a little pit stop, as it is located easily off of I-95. Flanders Bakery opens really early—4 a.m.—to serve the morning commuter crowd with delectable doughnuts and baked goods as well as hot coffee.A favorite from the doughnut selection is the crumb doughnut, which is a cake-style doughnut topped with delicious crumbs and sweet glaze. Dottie’s Diner has been around for so long that stopping for a doughnut is a must for any Connecticut resident or visitor. Dottie’s diner serves amazing cream-filled doughnuts as well as hearty breakfasts, lunches, and dinners. Beach Donut Shop is a really enjoyable little café and doughnut bakery with dozens of doughnut flavors baked fresh every day. The simple glazed and chocolate glazed doughnuts are melt in your mouth good and not overly sweet. The jelly-filled doughnuts are also a highlight of their offerings as they are packed with jelly. Both restaurant and doughnut bakery, Whitney Donut Shop has it all. Try the blueberry filled crumb doughnuts or the chocolate honey dipped doughnut for something really special. Whitney Donut Shop also has a good selection of gluten-free baked goods. Neil’s Donuts is another local favorite, so much so that the business has even been featured on News Channel 8. Neil’s offers over 30 flavors of doughnuts every day, so everyone is sure to find their favorite. Try a glazed cruller, Boston cream, or lemon chocolate to satiate your sweet tooth. Coffee An is well-known for their cinnamon doughnuts and rolls—so much so that you should take the time to visit even if you aren’t a local. The excellent service is sure to see you coming back for more doughnuts in no time. They also serve sandwiches, salads, and soups if you’d like a meal before a delicious doughnut dessert! Serving special creations and new flavor combinations daily, Dixie’s is a local favorite for southeastern Connecticut residents. In the display cases visitors will find sprinkled doughnuts, Boston cream, chocolate chip, and mocha almond. Stop in for a dozen today! This delicious Connecticut gem serves flavorful mini doughnuts and often sells out by the end of the day.The smaller doughnut size allows you to taste more flavors, which makes it a great option if you can never decide which flavor to purchase. 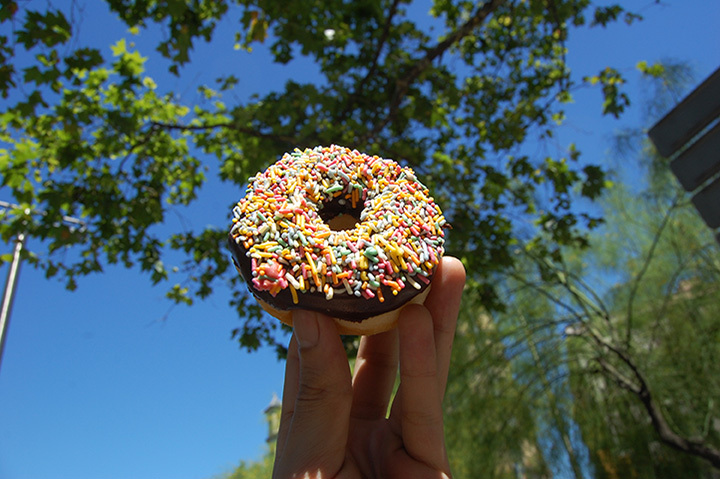 Doughnut flavor options are plentiful and include plain, sprinkle, glazed, and filled.